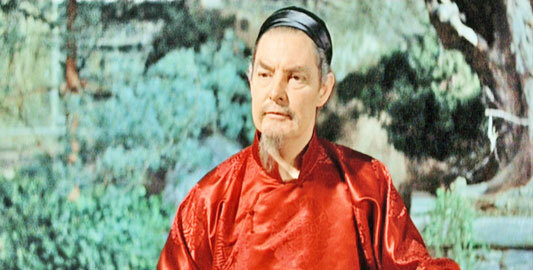 THE INN OF THE SIXTH HAPPINESS is the story of Gladys Aylward, an English servant girl who became a missionary in China. Her many years of trial and tribulation, joy and sacrifice are given an expensive ($4,000,000 was a lot of money in 1958) and lengthy (158 minutes) treatment, upholding the old Hollywood casting acumen by having the British heroine enacted by a Swede and filling the roles of her two closest Chinese associates with a German and an Englishman. 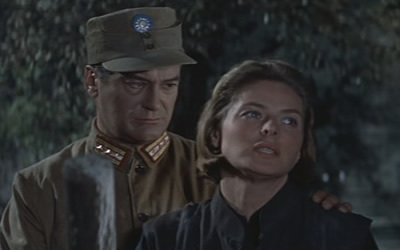 The three stars—Ingrid Bergman, Curt Jurgens and Robert Donat—surmount the handicap of their familiarity with honest performances, and there are a number of strong scenes scattered through the picture, directed rather squarely by Mark Robson. He got an Oscar nomination for his work. Good musical scoring from Malcolm Arnold, and the sets, costumes and sound are nicely done, with the rock-rugged terrain of Wales making a viable substitute for China. 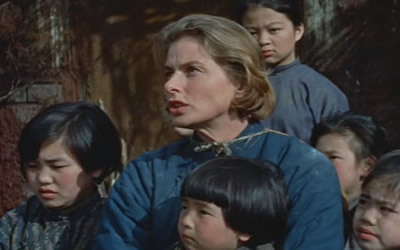 More notable for intentions and professional gloss than for much real impact, interesting but not too exciting, even when the Japanese invade and Gladys/Ingrid must lead a mob of orphaned children over the mountains to safety. As they trek, the kids sing “The Childrens Marching Song”, that nick nack paddy-whack’ number that became such a hit as recorded by Mitch Miller. It remains the most memorable item from the production. Aylward was not at all happy with how the film depicted her, the people she knew or the events. With Michael David, Athene Seyler, Peter Chong, Tsai Chin, Lian-Shin Yang, Burt Kwouk, Noel Hood.